"Great show tonight! Thanks for shedding light on why my wife thinks I'm always wrong." – Brian M.
"Fantastic Show Tonight. I know my abs will hurt tomorrow!" – Alisa E.
"You were amazing! Tonight was the final piece of my 50th bday celebration and it was the best!" – Melanie C.
"I had the great fortune of seeing the brilliantly funny Paul Reiser tonight. If you don't go them, well then, you have issues and I can't help you…" – Christine T.
Reiser recalls his memorable encounters with legendary Hollywood greats whose advice, friendship and example showed him how to be a better artist and better man. 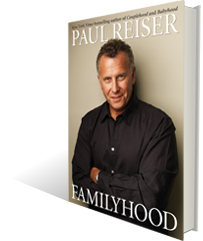 Both touching and funny, Reiser shares the intimate details of inspiring backstage moments with comedy greats such as Johnny Carson, Carl Reiner, Neil Simon, Carol Burnett, and Peter Falk, and what they taught him about life, work, and creativity. 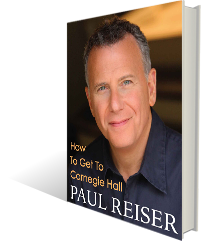 Finding himself at a loss for advice as his own children come of age, Reiser invokes an age-old joke — "How do you get to Carnegie Hall?" — to remind us that some things never change, especially the eternal value of hard work and practice. "For the longest time, based on no evidence other than our own insecurity and sense of incompetence, my wife and I were convinced that we were the flat-out, no-question-about-it, least-skilled parents in the country. Furthermore, we were convinced that every other set of parents we knew was perfect. They were more thorough in going over their kids' homework, they set better boundaries than we do, didn't let their kids watch as many hours of TV as we do, raised kids who are unfailingly polite in public and have a far greater sense of community and public service than our underachieving offspring over there on the couch watching SpongeBob. We were certain everybody else's kids willingly and joyfully eat nothing but healthy foods, shunning all candy and candy-based products, they all sensibly and automatically put on weather-appropriate clothing, and voluntarily call their grandparents with clockwork regularity, giving fully detailed accounts of their numerous accomplishments, ending with testimonials to their wonderful and perfect parents. Turns out: not so much. At all." 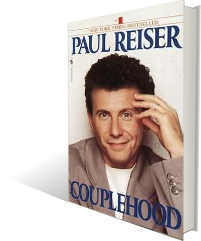 In the number one New York Times bestseller Couplehood, Paul Reiser writes about the highs and lows of falling in love and getting married—and the heart-break and hilarity that comes with it. In Babyhood, he turned his sharply observant eye to the experiences of having a brand-new family. 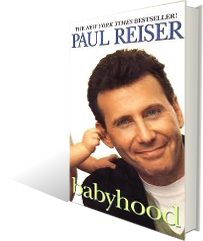 And now in Familyhood, Reiser shares his observations on parenting, marriage, and mid-life with the wit, warmth, and humor that he's so well-known for. From the first experience of sending his two boys off to summer camp—the early feeling of gleeful freedom in an empty house, to realizing how empty the house actually was—to maneuvering the minefield of bad words learned at school, this hilarious new book captures the spirit of familyhood, the logical next frontier for Reiser's trademark perspective on the universal truths of life, love, and relationships. "A fine endorsement," you say. "But if I have only one book to buy, shouldn't I go for the helpful one?" Those "know-it-all" books tell you how to have a happy, healthy pregnancy. My book mentions a squirrel. Those books tell you how to care for a newborn child. My book describes how tired I am. Those books give you essential information you can use in a life-threatening emergency. My book has some very amusing anecdotes about poop. So really, it's up to you. If you want to be prepared and well-informed, I understand. But if you enjoy seeing the words "pterodactyl" and "uterus" in the same book, you've got to the right place. Reiser brings his trademark wit to the page in a book that will delight his eagerly-awaiting audience, and anyone else who has ever fallen in love—or tried not to. In Couplehood, a New York Times bestseller for more than 40 weeks, Reiser reflects on what it means to be half of a couple—everything from the science of hand holding, to the technique of tag-team storytelling, to the politics of food and why it always seems to come down to chicken or fish. Actor/comedian Paul Reiser of MAD ABOUT YOU and DINER fame has teamed up with British singer-songwriter Julia Fordham for UNUSUAL SUSPECTS, an album of original songs featuring Fordham's vocals and Reiser's piano playing. Fordham contributed the lyrics, while Reiser, a composition major in college, wrote the music. The comedian describes the collaborations on UNUSUAL SUSPECTS as "bittersweet songs about loves that have died, loves that are dying, loves that you wish would do you a favor and die… surprisingly heavy stuff for two pretty contented people. (Paul wanted to call the album "Why So Sad?" but was thankfully dissuaded.)" Reiser also joined the cast of Netflix’s ‘Stranger Things’ for the series’ highly anticipated second season, which was released October 2017 and renewed for a third season. In a role created by the Duffer brothers with him specifically in mind, Reiser played Dr. Owens, a high-ranking member of the Department of Energy who is brought to the small town to investigate the supernatural situations at play. Reiser collaborated once again with David Gordon Green (‘Pineapple Express,’ ‘Prince Avalanche’), as well as with Steven Soderbergh on the critically-acclaimed hit Amazon series ‘Red Oaks.’ Reiser’s role as Doug Getty, the president of a New Jersey country club in a nostalgic 80’s themed setting, was called “one of his absolute finest, not just of late, but of ever.” The show’s third and final season premiered October 2017. Additionally, Reiser appears in the latest project of ‘Mad Men’ showrunner Matthew Weiner, ‘The Romanoffs.’ The mini-series is centered around the modern-day descendants of the mysterious Romanov dynasty. In his episode, now streaming on Amazon, Reiser co-stars alongside Christina Hendricks, Isabelle Huppert and Jack Huston. Reiser’s recent films include John McDonagh’s ‘War on Everyone’ with Alexander Skarsgard and Michael Pena, ‘The Book of Love’ with Jessica Biel and Jason Sudeikis,’The Little Hours’ with John C. Reilly and Aubrey Plaza, and the Lake Bell-directed ‘I Do… Until I Don’t’ with Ed Helms, Amber Heard, and Mary Steenburgen. © 2015-2019 Paul Reiser. All Rights Reserved.